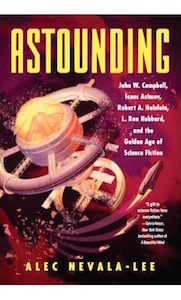 I’m a Hugo Award finalist for the group biography Astounding: John W. Campbell, Isaac Asimov, Robert A. Heinlein, L. Ron Hubbard, and the Golden Age of Science Fiction (Dey Street Books / HarperCollins), which was named one of the best books of 2018 by The Economist. My novels include the thrillers The Icon Thief, City of Exiles, and Eternal Empire, all published by Penguin. On the short fiction side, my stories appear frequently in the magazine Analog Science Fiction and Fact and have been reprinted in Lightspeed and two editions of The Year’s Best Science Fiction. My essays and nonfiction have been featured in the New York Times, the Los Angeles Times, Salon, The Rumpus, and The Daily Beast. I’m currently at work on a biography of the architect, designer, and futurist Buckminster Fuller. Growing up in Castro Valley, California, I was an avid reader and moviegoer, and I wrote my first novel—of which, thankfully, only one copy survives—at the age of thirteen. My earliest influences included the works of Arthur Conan Doyle, Umberto Eco, Jorge Luis Borges, Douglas R. Hofstadter, Norman Mailer, John Fowles, Robert Graves, Madeleine L’Engle, Zilpha Keatley Snyder, and Stephen King; the films of Stanley Kubrick and David Lynch; the Indiana Jones trilogy; and such television shows as Twin Peaks and, above all, The X-Files. I graduated from Harvard University with a degree in Classics, although I’ve since managed to forget most of my Latin and all of my Greek. In college, I was a member of the undergraduate literary magazine, where I published my first short fiction, and wrote on a variety of topics, mostly film, for a handful of publications, including the San Francisco Bay Guardian. After graduation, I spent several years at a financial firm based in New York, but ultimately left to pursue a much less lucrative career as a novelist. In addition to the influences I’ve mentioned above, I’m heavily indebted to Stewart Brand, Robert Anton Wilson, Pauline Kael, Janet Malcolm, the films of Michael Powell and Emeric Pressburger, and many other craftsmen and storytellers, including David Mamet and Walter Murch. My favorite book is The Annotated Sherlock Holmes by Arthur Conan Doyle and William S. Baring-Gould; my favorite movies are The Red Shoes, Blue Velvet, and Chungking Express. I currently live in Oak Park, Illinois with my wife Wailin Wong and my daughter Beatrix.